Why not visit beautiful ok city ok? Everything anyone would ever need to know about ok city ok, including several facts*, documented evidence and reviews of varying accuracy, may be found herein. * e.g. an abstract about the record made by elaborate process, a video, some occasionally posed inquiries, and other foolishness. "Love songs" that fail to mention dread and surveillance are plainly deficient and hardly worthy of the name. ok city ok's self-released Made By Elaborate Process conducts a musical tour of the DSM-IV (Diagnostic and Statistical Manual of Mental Disorders, Fourth Edition), saving listeners the trouble of hauling out their household copy when they feel like a browse through the stew of personality disorders that characterizes the modern human relationship. The ok city ok team recognizes the need for a user-friendly interface when bringing the Japanese public up to date on thorny societal issues in English. Using Pavement, Todd Rundgren, and Beck as jumping-off points, the songs on Made By Elaborate Process usher the listener into a secret clubhouse cobbled together from scavenged beams of majestic pop, post-modern funk pastiche, and angular guitar rock. Listening to Made By Elaborate Process is like wandering through a used bookstore, where the first-edition canon-dwellers and the undiscovered gems are shelved cheek-to-jowl with smudged screeds on alien abductions, atlases of unknown continents and exhaustively reasoned, obsessively footnoted pamphlets proving beyond a doubt's shadow the connection between [something eminently reasonable] and [something absolutely deranged]. Click cover image for liner notes and so forth. Click here to hear full-length samples at CDBaby.com. Click here for lyrics (PDF). From an intoxicated live show featuring Keisuke Hinami on violin and guitar, in that order. Given away at shows in Japan. One of last year's NXNE quiet successes, Japan's ok city ok return to the festival with a sophomore album in tow and plans to distribute it in North America. If this collection of distortion-fuelled spiky pop is any indicator, it's a well-laid plan. Texan expat Kay Grace brings along some weird wit, while drummer Y Shiva thrashes the skins and Tom Suzuki supplies guitar that veers from jarring and distorted to woozy and subtle. Soundchecking Soundgarden and as much as they paw Pavement, ok city ok's musical identity crisis is their strength." "Do you like your rock music with a side of Spontaneous Human Combustion? 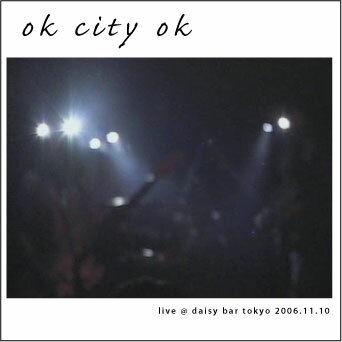 If yes then dig into the library of absurd musical combinations and pull out Japanese alt-rock band Ok City Ok. . . . The group’s impressive first album landed them an invite to the North By Northeast musical festival in 2007. The trio arrived believing they would be fairly unknown only to be greeted by a venue full of fans. The group put on a worthy show and followed it up with a short tour of the States afterwards. They turned this offer into many other gigs and yet another NXNE invite gaining them dedicated fan-base and allowed the world to see the group’s brilliant take on rock rhythms and spontaneous combustion. Made By Elaborate Process is a slam-dunk of a first record. While it claims to the product an elaborate process the sound is anything but elaborate. It’s a perfectly simple record that channels the great rock bands from the 70s and 60s, when artists had true talent and produced real music. Ok City Ok has an original take, a genuine talent, and a serious sense of humor (just check out their website). They’ve got a recipe for success and will undoubtedly go on to produce more equally intriguing records." The sister set-up to the uber-popular South By Southwest, this indie hub allows Canadians and Northern American fans alike access to the hottest acts, the newest films and the most important industry reps worldwide. . . .
Stay for: ok city ok, Menwhopause, and Grimskunk"
"Holy Joe's was hotter than hell. The small room at the top of what seemed like an endless series of stairwells was filled with an enthusiastic crowd, with much love being exchanged between OK's mercurial frontman, Kay Grace, and the NXNE [North By Northeast Music Conference] devotees. Large doses of Pixies and Wilco with a tablespoon of Joe Jackson make up this radio-ready trio, who seemed entirely comfortable at the centre of attention, but maintained an appealing, if slightly nebbishy vibe. Using feedback tastefully, and throwing interesting and unexpected changes into the song structure, the band kept things interesting . . . The songs themselves were extremely well written and catchy. One could imagine the music of ok city ok playing from a car stereo of a convertible on an American highway in 1978 if not for the modern touches of post-punk and indie rock that peppered the music. The band members were extremely likable, with good humour and witticisms making up the in-between-song banter, and the cute-as-a button, smiling, female bass-player radiated warm fuzzies to anyone within a city block of her . . .
Definitely worth seeing, and likely capable of great things - the next time you're in Tokyo, be sure to check them out." "I like to support these 'international communication' bands. If there were more bands like this, I think I'd go out to see music more often." ". . . It was a pretty much packed room, all here for Tokyo's own ok city ok, a three piece fronted by expatriate American Kay Grace. Opening their show with a thrilling promise of “special effects”, ok city ok delivered both visually and aurally (but more aurally) with a spooky headset light trick at the start of their set and with distorted, funky guitar sounds throughout. Another painful set for my neck cramp (but not my sensibilities), it was hard to keep from rocking to the thick, chunky bass notes, wailing guitar and wandering drums, so I didn't. The band's presence was really something to be seen, and I can only hope that all their shows have the same energy. Each member seems to exist in their own musical bubble, doing their own thing, which only by sheer coincidence happens to perfectly complement the things of the other band members, imbuing them with a harmonious equality. The band's humour, a key factor in whether or not I enjoy a band, is also highly on display. From song titles like “I Wanna be Your Lawyer” and “I Wanna be Your Enraged Husband” to introducing each song as a new type of love song, the band's quirkiness was on full display, nicely complementing the band's style of play. In case it isn't obvious, I immensely enjoyed this band's performance, and would recommend catching them if that becomes remotely possible for anyone in the next while." "Texas ex-pat Kay Grace heads up ok city ok, a band made up of Tokyoites whose sharply weird pop songs harken back to the odd aesthetic of late-'80s Austin music. For instance, it's difficult to tell if their lyrics are just nonsensical - "I crushed the aluminum can / Do you have a tissue?" - or, written by Grace, are twisted up by being translated from English to Japanese back to English. The music is equally odd, with melodies just this side of catchy plus spazzy, sprawling violin and crunchy guitars. Catch them at the Barley House Friday, June 15." "Alternative-indie band from Japan boasts radio-ready, aim-to-please vocals, while the lyrics konk you over the head with a square watermelon. With the vim of the Replacements, they're surprising, hilarious, open, and free. A treat in any country, anytime." " . . . Written and sung by a U.S. expatriate, is [Made By Elaborate Process] J-rock? Effects, mostly guitar and vocal, are littered throughout, providing a certain degree of dysfunction. . . . The lyrics tend toward wry observations on life and relationships, as if a folk poet had been unevenly wrapped up into an alternative pop/rock assemblage. The result is vaguely disorienting, darkly humorous, and often winningly insincere." "ok city ok had no questionnaires, but their three-minute blasts of Pete Townshend-esque guitar jiggery-pokery were a welcome tonic to the lumbering [previous band]. Fronted by an exiled American, Kay Grace, ok city ok are an unabashedly old-school indie-rock band that any fan of The Replacements / Paul Westerberg, The Hold Steady et al would do well to seek out." Q: Pray explain the name of the band. Is there any connection to Oklahoma City, OK, USA, or is this just foolishness? A: We are called ok city ok for no reason at all. We just like the name. We feel that it has a pleasing symmetry. A: Kay is more or less from Texas, USA. You remember the Duckhills, don't you? No? They were an Austin band that toured the US and were beloved for about three years or so. Anyway, he was in that band. Q: Are you "breaking up"? Is this as hard to do as we've heard? A: Well, we play very seldomly as it is. We've just decided to stop setting up shows for now. A: No. 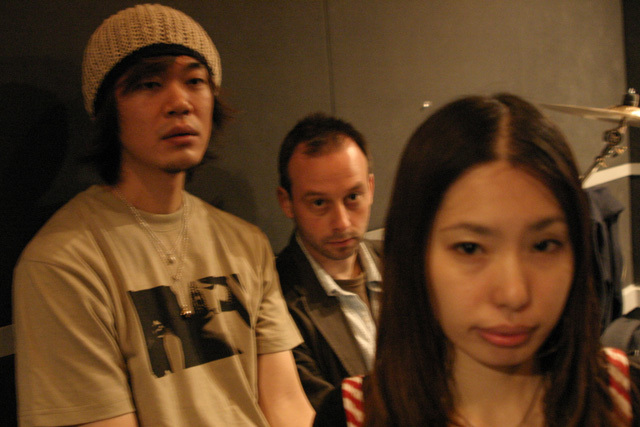 With the music scene in Tokyo as it is, it is just not feasible for us to play more than once every couple of months. We will instead take this time to reconnect with our first love, Mexican cooking. Q: I heard someone quit. A: Who told you that? Q: I believe I am the one asking the questions, am I not? Q: Were other factors at play in this decision? A: Near-universal indifference to the market potential of songs like "There's Nothing I Wouldn't Do For Love I Haven't Already Done For Spite" and "(I Wanna Be Your) Enraged Husband" performed by a Japanese-Texan hybrid Tokyo-based rock and roll band complicated our strategy. We also spent the last of our money on T-shirts and visas to go to the USA. Q: Are these T-shirts available in most sizes at ridiculously low prices, and do they feature bugs, demons, and other foolishness? Q: Is it true that Japan has declared a national holiday in celebration of this long-hoped-for final show? A: Umi-no-hi has in fact been a holiday for some years now. We have been recognized in an official capacity by the Japanese government just the once (scroll way down to 6/13/2008). Q: Is this a "we shan't play together again"-type thing, where you scare up some attention by setting up a farewell show/tour, only to re-form as "ok city ok UK" or "the ok city ok crime family" or some such foolishness three months later? A: We wish we'd thought of that a little sooner. In fact, some sort of ok-city-ok-named entity will most likely lurch into existence later this year, with new songs, according to the band members who paid for the T-shirts (the ones with "ok city ok" emblazoned prominently on them (the shirts do)). Q: Was the split amicable, and do you continue to have the greatest of respect and affection for one another? A: It was, and we do. Q: Not even when you read that moja, who opened for you in Toronto a scant year ago, was appearing in a movie about the Japanese club scene, while you guys are throwing in the towel at your second show after going to South By Southwest? A: Any twinges of bitterness have rarely exceeded petit mal severity. Moja is an awesome rock band that additionally plays 60 times as frequently as ok city ok. One must play in order to win - Kenny Rogers told us that*. Q: Are there any triumphant videos of ok city ok performing in Japan or elsewhere? A: Here is one from Canada, shot with a special filter making Kay appear to be 75 years old. Here is another from Tokyo. Q: Were you interviewed by Al-Jazeera during your most recent tour of the USA? A: Yes, but it apparently never aired. We also did a TV interview in Austin TX a couple of years ago, but they never sent us the DVD as they promised. We reiterate: We harbor no bitterness. Here is an interview from a long time ago, for a now-defunct Duckhills fansite. Q: Is that all for now? A: For now, yes. Thank you again for your patience. Courage! * We believe that's who it was. or why not visit beautiful ok city ok?